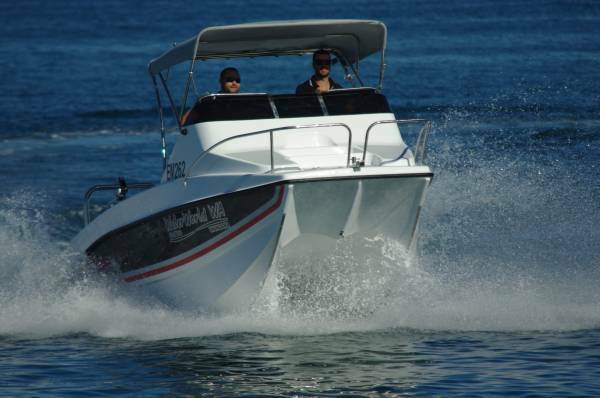 An 18ft power cat for under $63,000 is good going, and it does not have to be a stripped-out Spartan job to reach that figure. 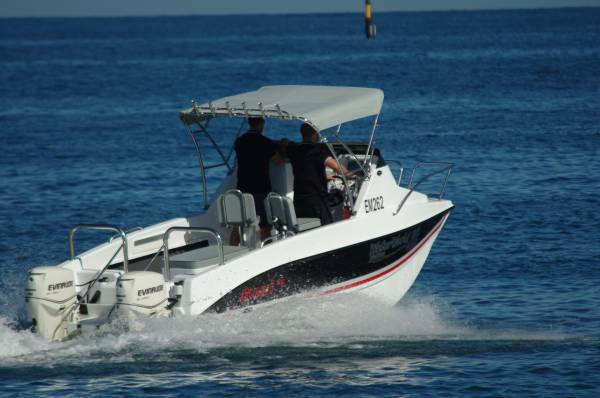 The Seacat 565FC is anything but bare bones and still achieves it, admittedly with less horsepower than the review boat. Many fishermen consider a cat their personal holy grail, and the 565 unquestionably caters for the angler. Space, the first requirement, is achieved by pushing the windscreen well forward and keeping the perimeter clear of obstructions. Stability, the second, is a given for a cat. Move three weighty men – all we had available – anywhere, singly or in bulk, and the result was hull movement that would need instruments to detect. The FC, for forward control, is an alternative to a centre console version, and it has a lot going for it: as much useable space, better shelter, more storage and a clubbier atmosphere. The shelter is less of an advantage than on lesser boats as the Seacat is not a thrower of spray, although the greater wind protection was very acceptable. 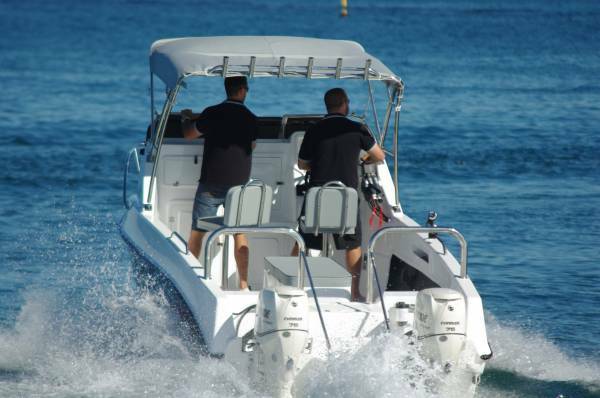 Ride quality is one of the traditional assets of catamarans, and the Seacat achieves its own high standard with a hull of great subtlety. Long raking bows give gradual increase of buoyancy if they bury in a wave, softening impact and slowing pitching motions. The hulls have keels, combining with reversed chines right up to the bows to trap air, further softening ride. No boat ever had too many places to put things, but only the greedy could want more than the 565 serves up. Where most runabouts have open space beneath the windscreen here there is a bulkhead infested with doors. Some open onto lockers, another reveals a nest of tackle drawers. A couple expose the rest of the bulk space under the foredeck. But serious bulk storage is within the central box seat. My wife could not fill this one. There are four lids in the deck. Two unsurprisingly cover long catch tanks; the others reveal something unusual in this size of boat: portable fuel tanks. Provided they actually hold enough for your needs, portable tanks have some advantages. The main one is they are easy to drain so do not amass condensation and stale fuel. The remaining doors are for the two separate battery systems, and the last compartment is the live bait tank with its clear window. The last of the specialized fishing storage is provided within the bulwarks – rod racks. A pair of swivel seats on pedestals faces the windscreen. They are comfortable enough, equipped with foot rests in the right places, but the more natural driving and navigating position is standing. The windscreen has a grab rail above it to help with this. The dash is neat and there is plenty of area for locating electronics and switch gear. On the 565 though, a compartment with a clear door is provided for the main display. Useful if you like the idea of removing it between trips to prevent theft. The centre of the windscreen lifts out to give access to the foredeck. The bulkhead has a moulded step to ease the transit, and the foredeck has a series of horizontal planes for good footing. There is no bowsprit, but the lidded anchor well has room for plenty of rope as well as the anchor. 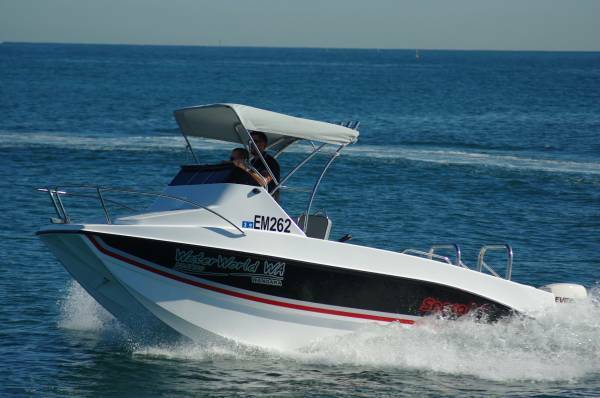 A pair of 75hp Evinrude ETECs powered our boat and did a good job of it. They would have no problem in maintaining 25 knots for hour after hour. The builder suggests twin 60s as a minimum, which would save dollars but might be disappointing if you regularly fish with a lot of friends aboard. On the other hand, the maximum twin 100s would be several horsepower too far for my tastes. 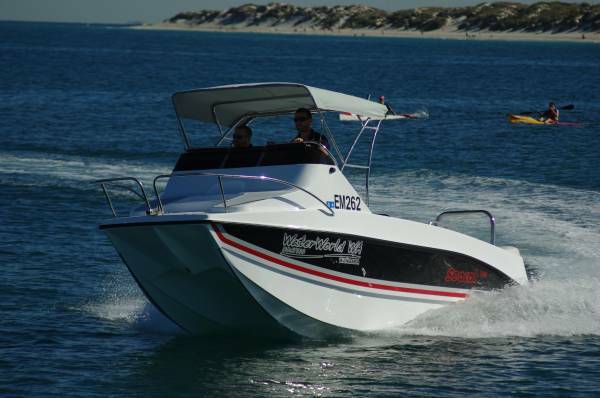 Towing weight can be a consideration with cats, but this is a light one – 750kg hull weight. The standard aluminium trailer adds little to this.